The devastation of a fire in your Bridgewater residence quickly brings home how involved the cleanup is. Residues spread everywhere, on all surfaces. The soiling differs from regular dirt and grime, and DIY efforts to clear it away often make it worse. 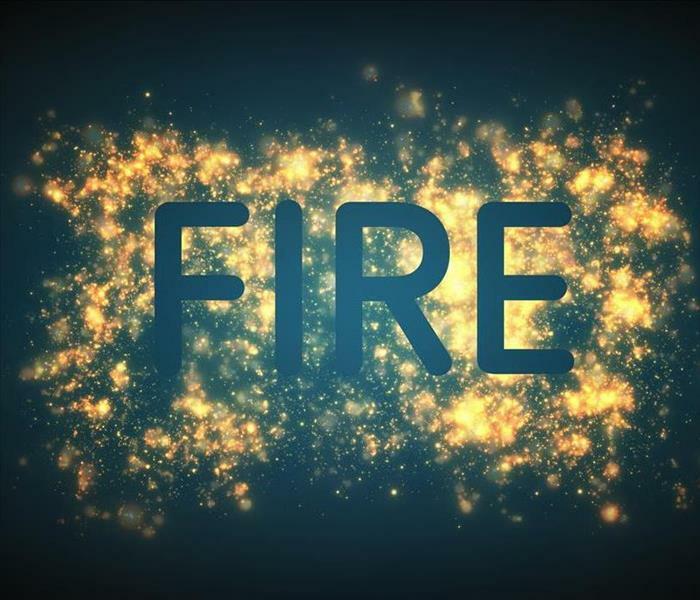 Dozens of tasks face fire remediators, and our experts are familiar with the work needed and use proven strategies to complete the project fast and thoroughly. When fire damages your Bridgewater home, you might be surprised to note that water and chemical damage are two of the first things to manage. Firefighters leave vast amounts of water and chemicals behind after extinguishing the flames. Water causes considerable damage on its own, and its presence creates a slip and fall risk as well as exposing everyone in the building to electric shock possibilities. Because we are a full-service restoration company, holding multiple certifications from the IICRC our assessment team adds water remediation to the project blueprint as phase one. SERVPRO assessors inspect all areas of your home and evaluate the types of residues deposited in different places. Dry, ashy soot from burning wood and paper dry sponges and vacuums away. Thick, sticky soot from fabrics, plastics, and electronics smoldering needs a cleanser enhanced with wetting agents and surfactants to loosen the coating, and often agitation to eradicate it. Kitchen fires deposit a thin, smelly layer of protein-based soot, requiring solvents and abrasive tools and action to resolve. Odors present a challenge, lingering even after SERVPRO removes all the other toxic wastes left by the fire. Our deodorizing technicians follow a detailed protocol to remove and clean any burned item or surfaces still emitting smells. We inspect HVAC systems, cleaning and sealing hard to reach areas if the odor emanates from the air ducts. Technologically advanced equipment like thermal foggers, ozone machines, and hydroxyl generators are useful for eliminating both airborne and settled odor-bearing particles. Each of these approaches changes the chemical makeup of the minute bits of combusted materials still sharing unpleasant odors at a molecular level, neutralizing the smells. Rely on SERVPRO of Northeast Somerset County to manage all aspects of fire damage remediation fast. Our highly-qualified professionals are available 24/7 by calling (908) 222-2020 immediately after the firefighters leave your home. More about fire safety by clicking right here. Water loss incidents can affect Bridgewater homes in different ways, but with the fast spread of damages throughout your property, it is a situation that needs addressing quickly and professionally. Without a full understanding of the damage to your home, it can be easy to inadequately clean and dry up saturation and standing water, allowing structural weakening, degradation, and hazardous conditions to persist. Our professionals have advanced detection equipment to get the full scope of the damage to begin thorough and intricate extraction, drying, and cleaning efforts. Not all water loss events in your Bridgewater home leave standing water throughout the affected areas, but the water damage effects that do exist still require the trained personnel and advanced equipment available to professional restorers like ours. The SERVPRO experts that arrive at your home waste no time in identifying the threats and getting to work on vital mitigation efforts that can reduce restoration time and save our customers money. While mitigation has many steps, one of the most important when facing water damage threats is drying. We have a broad inventory of recovery equipment including many high-velocity air movers, a variety of dehumidifiers, and even specialized equipment like the Injectidry system. Our SERVPRO Green Fleet stays stocked with these advanced tools and machines so that our professionals can respond to all water loss emergencies at a moment’s notice. Air movers can be a critical component to the drying and recovery of a water-damaged home. With strategic placement based on the location of moisture pockets, these forced air systems can displace moisture with heated air, sending a vapor into the environment. This moisture in the air can get removed and collected by our LGR or desiccant dehumidification equipment also installed throughout the property. While drying is only a portion of water damage recovery, the more efficient and effective this process is, the less reconstruction and further restoration techniques the property ultimately needs. You can depend on the quick response and expertise of our SERVPRO of Northeast Somerset County professionals to make water loss emergencies “Like it never even happened.” Give us a call anytime at (908) 222-2020. Click here for more about Bridgewater. Fog away that soot smell! Crew Chief Angel fogs the seating area of the affected theater. 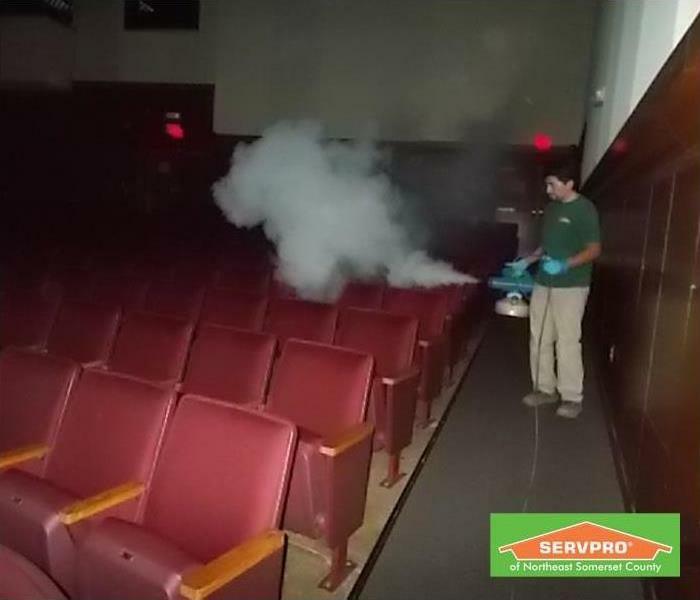 When a local high school’s breaker panel malfunctioned and started a fire in the backstage of their theater after hours, SERVPRO was on the scene that night. Luckily the structure was concrete so that was structurally sound, but soot covered that backstage room and the smell of smoke was everywhere. 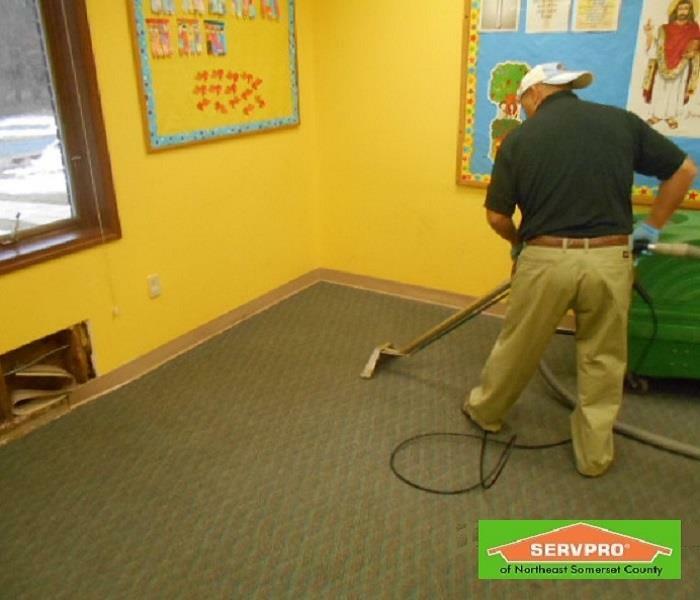 Our crew followed the SERVPRO-standard procedure of cleaning what sooty material could be removed first and then fogging all areas of the school where the smell had traveled. Fogging is not a perfume or fragrance to cover unpleasant smells. The fog used in this case reacted with the smoke molecules to break them down and get rid of the smell. There are other fogs formulated for other remediations we perform, such as mold. Another Successful Continuing Education Class! Our owner John introducing the class. 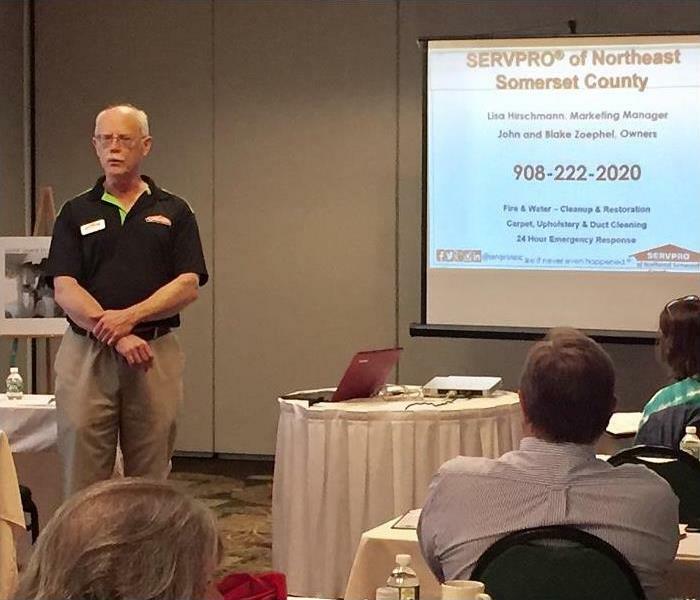 SERVPRO of Northeast Somerset County was privileged to have Steve Lyon of the Lyon Consulting Group to come this month and speak to many of the insurance and real estate professionals we work with regarding ethics. The class was held at the beautiful Hilton Garden Inn near our offices in Bridgewater. Steve gave us a very entertaining and informative class. If you’re interested in information on our future CE classes, please contact our Marketing Manager Lisa at lisa@SERVPROnesc.com. The damage that greeted our customer on their return from vacation. If you have a water damage, call SERVPRO at 908-222-2020. I would like to take this opportunity to thank you and your team for everything you have done for me and my wife during our time of crisis. …After returning from a vacation I opened the door to my house to find it was literally destroyed from a water leak. … You were at my house shortly thereafter, assessing the damage. You were knowledgeable as to what had to be done, but more importantly very kind and patient with the questions my wife and I had for you. A few hours later you had a team [on site] that started the clean up and drying process of my house. It was reassuring to know that you were there, overseeing the work. Your team was exceptional, in that they were careful with our belongings, but more importantly thoughtful and sympathetic to what we were going through. I truly hope no one has to go through what my wife and I did, but it is reassuring to know it is people like you and your crew that make it a little easier. 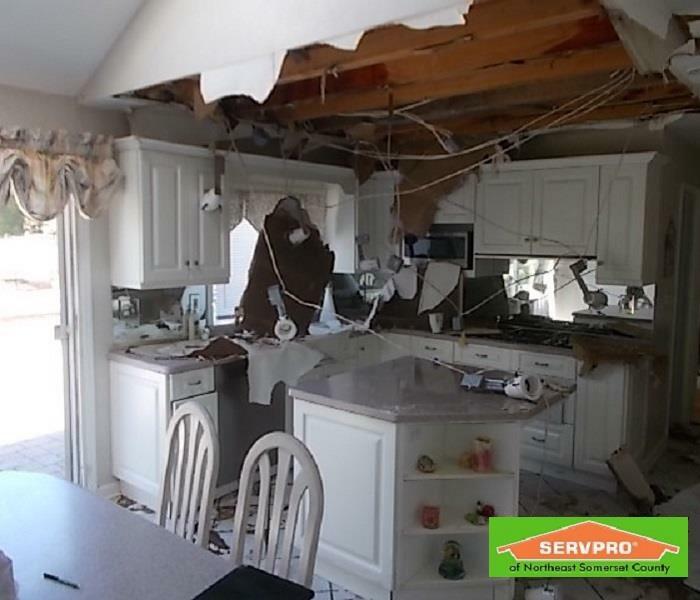 Nobody anticipates damage to their home, but if it unfortunately happens you can count on SERVPRO to respond 24/7 to help you get back to normal as soon as possible. 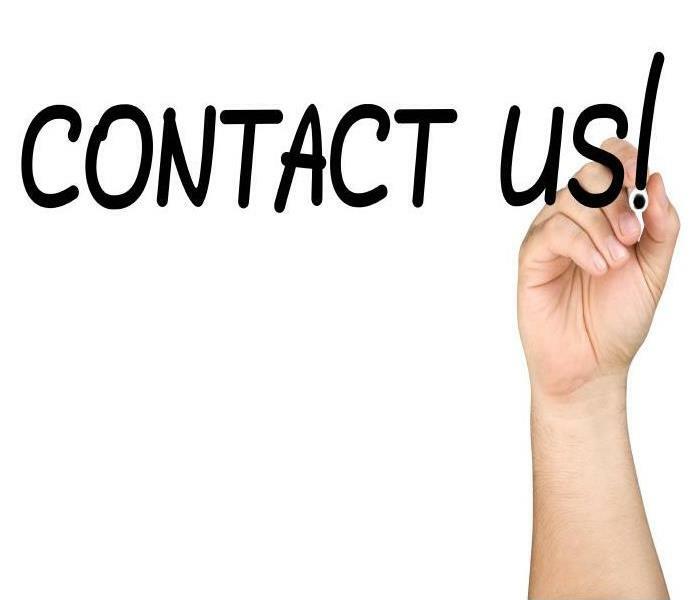 Call us any time at 908-222-2020. 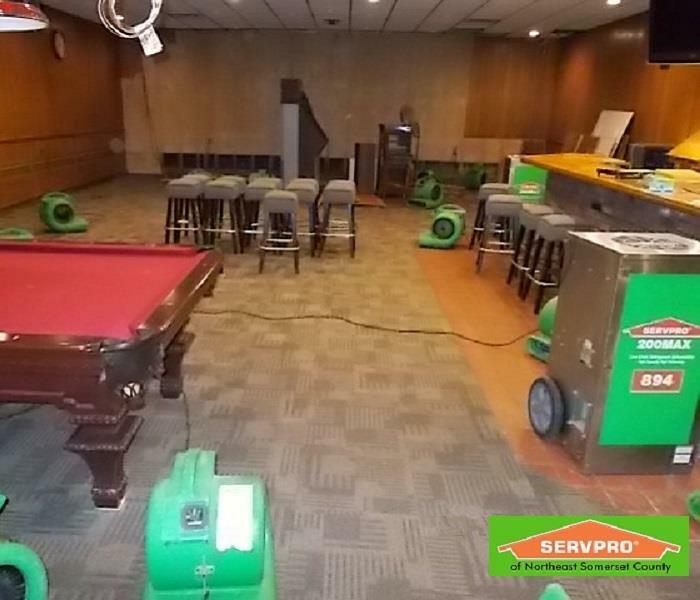 SERVPRO’s drying equipment at work after a water damage at the Bernardsville Fire Co. If you need your property dried out, call us at 908-222-2020. 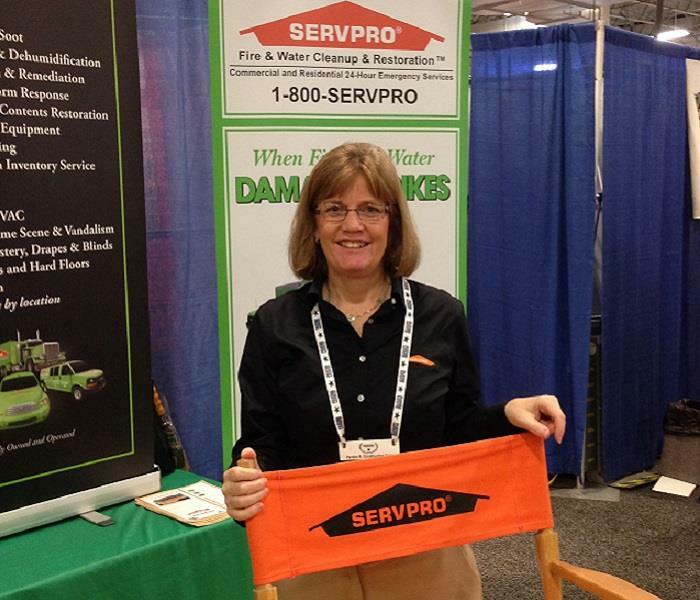 When the Bernardsville Fire Co. has a water problem, they call SERVPRO of Northeast Somerset County! Come by SERVPRO's booth to say hi to Lisa or Ron and pick up a giveaway! Our Marketing Manager Lisa had a great time at the New Jersey Cooperator Expo at the Meadowlands Exposition Center yesterday! Look for her next at the New Jersey Apartment Association Conference and Expo in Atlantic City on May 25th. Come by our booth to say hi and pick up a giveaway! 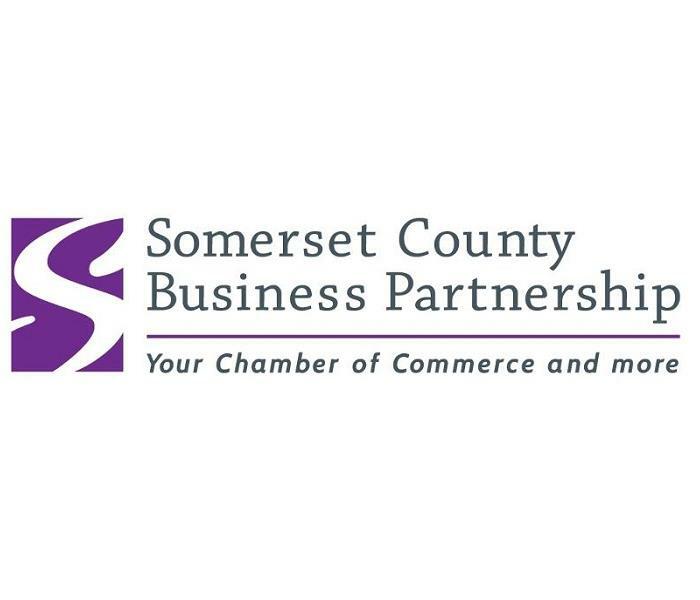 SERVPRO of Northeast Somerset County is a proud member of the Somerset County Business Partnership. SERVPRO® of Northeast Somerset County has been serving the fire, water, mold, and cleaning remediation and restoration needs of Somerset County, NJ since 1999. The owners of SERVPRO, John and Blake Zoephel, are very conscious of the need and responsibility to preserve our environment starting locally. Lisa Hirschmann, our Marketing Manager, is a member of the Somerset County Business Partnership’s (SCBP) Sustainable Somerset group, which issued the Green Challenge. The Challenge has been a great opportunity to review our day-to-day procedures in our Bridgewater office and on our job sites, to make sure we are doing everything we can to have a positive impact on the environment. The detailed Challenge questions guided us to focus on all aspects of sustainability. The new ideas and initiatives of the SCBP Green Challenge will continue to be integrated into our job flow. SERVPRO realizes our responsibility as a locally owned business to operate aware of our effect on the environment. With the leadership of the SCBP and participation of our fellow small businesses, we are excited for the future success of the Green Challenge and its positive impact on Somerset County. If you are a local business that is interested in participating, see the Sustainable Somerset Green Challenge. For your commercial and residential fire, water, mold, and cleaning remediation and restoration needs, contact SERVPRO 24 hours a day at 908-222-2020. 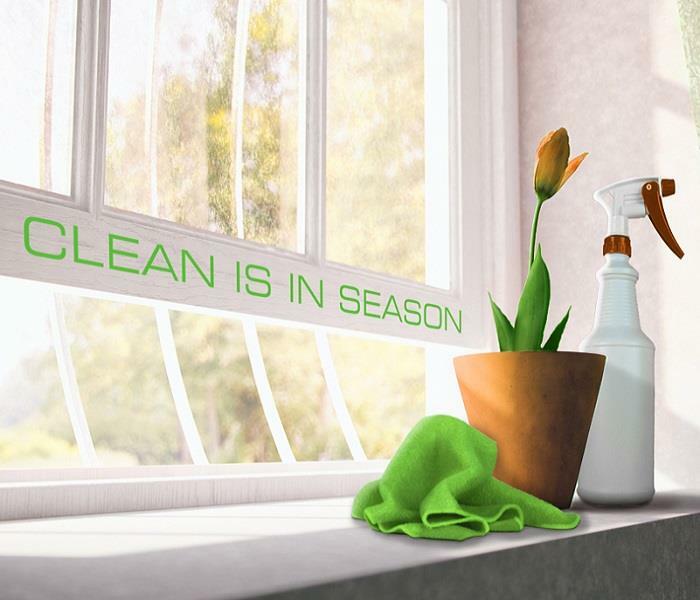 Call SERVPRO at 908-222-2020 for a thorough spring cleaning! Here in New Jersey it looks like the temperatures are finally (hopefully!) on the rise. That means it’s time to start thinking about spring cleaning. The Institute for Inspection Cleaning and Restoration Certification (IICRC) is a professional organization from which all our crew members have certification. The IICRC has some great recommendations that can be used for cleaning or maintaining any commercial or residential property. The most obvious are areas near entrances to the outside, but dirt can also accumulate where flooring changes, such as from carpet to hardwood or tile. Cooking oil, pet dander, and dust mites are also common issues. Thoroughly vacuum all high-traffic areas and frequently-used rooms. To keep your carpets clean, keep your other floors clean as well to discourage dirt from being tracked from one surface to the next. Disposable cleaning pads or reusable mops or microfiber pads should all be followed by rinsing to remove residue. Using the wrong solvent, temperature, or even water on some materials can result in more issues than those caused by the original stain. If you are unsure, call in SERVPRO and we can clean and assess almost every kind of upholstery. For more information, see Carpets and Upholstery Cleaning. No matter how thick your carpet, it is likely hiding a good deal of dust, dirt, and oily residues. As with upholstery, the wrong treatment of stains can cause more issues, particularly if left for long periods of time. SERVPRO will use our years of professional knowledge to assess the individual needs of your carpets and rugs. The IICRC recommends a deep clean every year. In the winter, heavy snow or expanding ice can cause damage that is only apparent once it has begun to melt (as in the situation we took care of at this local Hillborough church). Check walls and ceilings for stains, and don’t forget areas like the basement or attic that you only rarely see. You want to take care of moisture issues before they become mold issues. If you do find moisture you want to consult a contractor or structural engineer to ensure the source has been stopped, then call SERVPRO to come in and make sure everything is dry and remove materials damaged beyond repair (see Building and Reconstruction Services). If the situation has progressed to mold, we are also highly experienced in mold remediation. See Mold Remediation and Restoration for more information. The season change is always a good time to assess the state of your HVAC system, whether it might need a checkup by a HVAC professional or a thorough duct cleaning. SERVPRO is certified to do duct cleaning and has experience in everything from small houses to large commercial spaces. Many factors affect how frequently they need to be cleaned, but the IICRC recommends about every three years. For more information, see about SERVPRO’s Air Duct and HVAC Cleaning. Our professionally trained and licensed SERVPRO cleaning technicians would be happy to help you with any or all of these projects. Call us today at 908-222-2020. Production Technician Wilber extracting water from the carpet. Snow and ice can cause damage after the storm has passed. Once snow builds up on a roof, the weight can stress the structure and create openings. Heat can escape through cracks and melt the snow, causing water to leak down into the house. In another situation, the snow remains frozen at the time, but once the weather warms, melting snow will begin to leak. Depending on the size of the opening, the amount of snow present, and the location of the damage, there can be anything from one ceiling spot to water travelling down inside the walls, affecting upper and lower floors. Ceilings, walls, floors, and contents can all be affected, and it is important to stop the source as soon as possible by removing the snow and fixing the roof damage. As soon as the source is stopped, SERVPRO will be on site to remove the water and save as much of the affected structure and contents as possible. After an early February snowstorm, a church in Hillsborough, NJ, discovered a leak in their classroom ceiling. Their roof had recently been replaced and the contractor had to return to shovel some of the snow off the over-stressed structure. As soon as the source of the leak (the snow) had been removed, their facilities manager called SERVPRO of Northeast Somerset County. Once we were on site our crew got to work assessing what had been affected using our moisture meters. The affected section of the ceiling had to be removed due to water staining. Part of the walls were too wet to be saved and once removed allowed access to the structure. We extracted the water from and sanitized the carpet. We then put our drying equipment, air movers and dehumidifiers, in place for a few days. When we returned, all the affected area was dry. With our fast storm response and using our quick and thorough drying process, we were able to save the carpet and most of the structure. Finally, we removed the equipment and cleaned and deodorized the carpet. With that, the church was able to resume use of the room. 4/30/2018 - Fog away that soot smell! 10/20/2017 - Another Successful Continuing Education Class!